Silver Efex Pro from Nik software is a dedicated black and white plug-in for use in Adobe Photoshop, Lightroom and Aperture. Costing around 199 Euro, the main new features of version 2 include an intuitive history browser, structure and fine structure, soft contrast, GPU processing, dynamic brightness, neutral image borders, specially developed algorithms, black and white amplification and selective colour. All these are on top of the existing features found in the original version, which we reviewed back in 2008. Nik Silver Efex Pro 2 costs $199.95 / 199.95 Euros, or $99.95 / 99.95 Euros to upgrade from version one. We were suffering from a bad broadband connection when we downloaded and installed Silver Efex Pro 2, so we can't give a fair appraisal of download times. But if it runs as quickly as other Nik software programs we've downloaded, you should be up and running in less than 10 minutes. 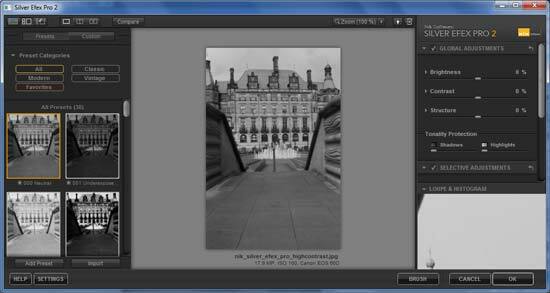 To enable Silver Efex Pro 2, you have to load an image into your editing suite. For the purposes of this test, we used Adobe Photoshop CS4. Once the picture is loaded, go to the Filter tab, select Nik software from the bottom and choose Silver Efex Pro from the list. After launching, the picture you selected will appear in a separate window within the program. 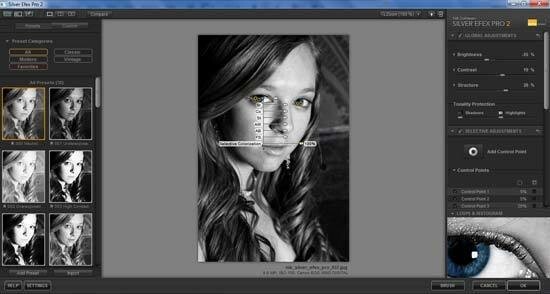 It will already be converted to one of the black and white modes in Silver Efex. The main window is split into three parts. On the left are the black and white filters which can be shown all at the same time or divided into three preset sections and one custom. Alternatively, selecting the All option will display every filter available which is much easier to browse, albeit longer. The great thing about these preset modes is that they're all so different that you will more than likely find an option in there to suit any kind of picture that you've taken. However, if you find yourself at a loss or if you want to make some tweaks, the right side of the window allows you to do just that. There are five tabs to choose from and once you've clicked on one of the effects and the main picture in the middle of the window has changed, you can then start to move sliders on the right to make your own adjustments. If you want to start from scratch, pattern 000 (neutral) has all the settings at zero so you can make changes as you wish. There are three main sliders for brightness, contrast and structure. 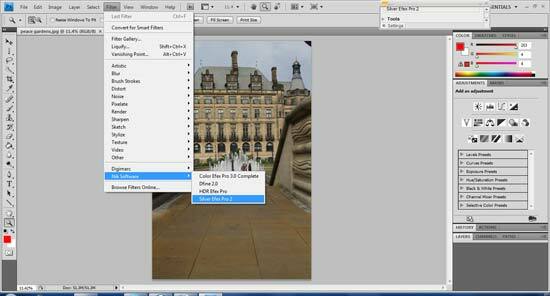 The structure slider gives an effect similar to the clarity adjustment that is found in Adobe Raw. Two of the new features in Silver Efex Pro 2 are dynamic brightness and soft contrast. The two sliders here for brightness and contrast use those new features. Both features analyse the tonal qualities of the picture and adjust their settings according to the results. That means that with the brightness, unless you move it right up to 100%, you're less likely to get burn out in highlights but you can still gain detail in shadowy areas. Like-wise with soft contrast, it doesn't simply shove a load of contrast on the picture, it applies it delicately, adding different amounts to different parts of the picture to make sure it remains sympathetic with the result you're trying to achieve.